Women 10s to be part of this year’s Vodafone Vanua Championship. 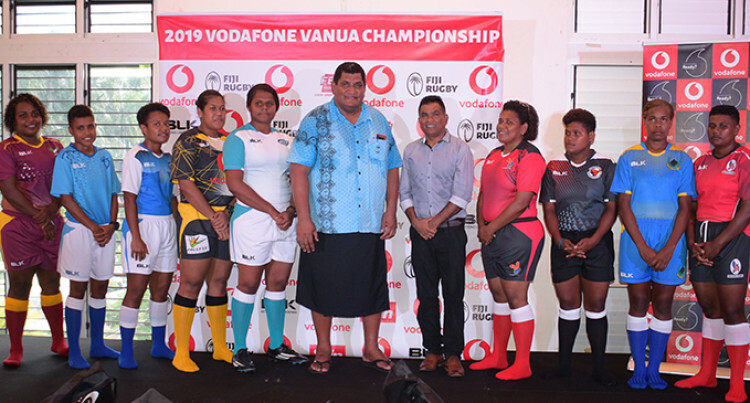 For the first time a Fiji Rugby Union women’s 10s competition will be played from this year’s Vodafone Vanua Championship. This was unveiled yesterday during the official launch of the Vodafone Vanua Championship at Albert Park in Suva. 11 teams in the Vodafone Vanua Under-19 Championship. Speaking during the launch FRU chief executive officer John O’Connor was overwhelmed with the support from Vodafone. “As sponsors Vodafone has greatly supported us over the years and last year had been an amazing year for Fiji Rugby in terms of achievement on and off the field,” he said. “And Vodafone not only extended their partnership to this competition but also towards Kaji Rugby and the Deans competition which us yet to be launched. Vodafone Fiji head of e-Commerce and corporate affairs Shailendra Prasad said this is the third year in succession that they are supporting the Vanua championship. “Through our sponsorship to FRU, last year, for the first time a Vodafone Vanua selection team were able to make an overseas tour. “This is a huge boost for grassroots rugby as players get the much-needed exposure and experience to play at international level. get them to develop to their full potential.” Prasad said in a change in format has allowed a longer duration of competition as opposed to the compressed two weeks. “This in turn produces better quality matches with better coached and well rested players. each participating Union with $20,000 participation grant for the senior teams and $5000 for the U19 team. $5000 will be the first allocation payout during the launch while the remaining allocations will be paid in subsequent months of May and June 2019. All Unions received 10 Gilbert rugby match balls, to be allocated for each of the representative teams. Fiji Rugby UnionKaji RugbyUnder-19 ChampionshipVodafone Vanua Championship.